Honor the memory of someone who brought love and light to your life. 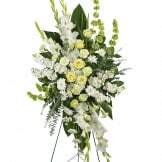 Graceful white mixed flowers with peaceful greens are combined to create this lovely spray. 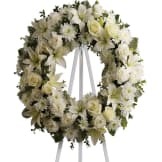 • This all white casket spray includes alstroemeria, snapdragons, chrysanthemums, million star gypsophila, huckleberry, salal, and sword fern. 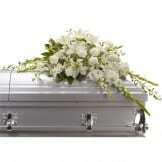 • Casket sprays are traditionally sent from members of the immediate family. 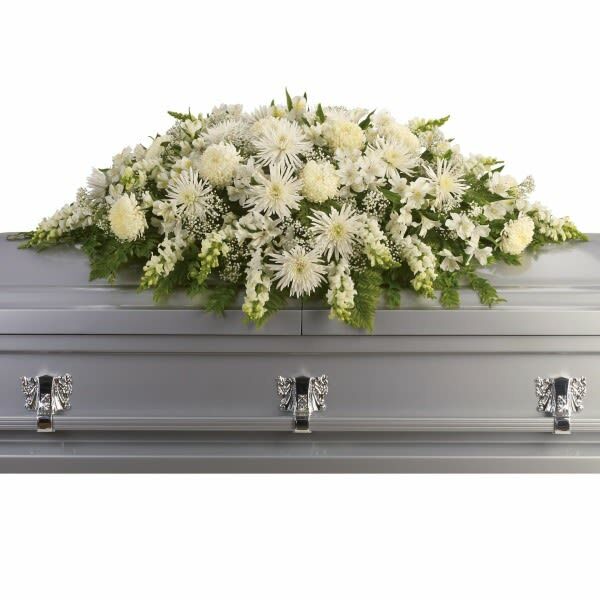 • This item will be delivered directly to the funeral home and placed on the casket by a member of the funeral home. 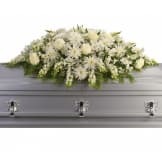 • The dimensions of this spray measure approximately 54" W X 23" H.
Flowers will be received by a Culberson Funeral Home's staff. All of our flowers are designed and delivered by hand from a local florist in in Hagerstown.